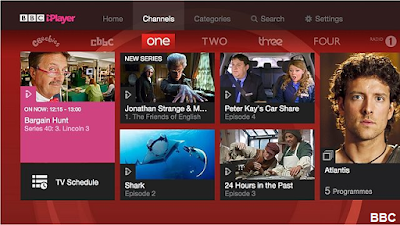 Users with a suitably fast internet connection are now being offered iPlayer content in basic HD (720p) as part of the latest updates to the popular catch-up service. Available on computers and connected TVs which support Adaptive Bitrate, the new basic default HD setting is dependent on how much bandwidth a user has available. Devices that don't support Adaptive Bitrate can opt-in to an HD stream, subject to bandwidth, via an HD button. HD streams of those BBC channels with an HD variant were made available on the iPlayer earlier in the year. Meanwhile, Dan Taylor-Watt, the man in charge of iPlayer confirmed that the latest Android and iOS iPlayer apps, available since late August, have been updated to offer live rewind - allowing viewers to rewind the live streams by up to two hours. The popular function, first launched on computers four years ago, is widely used as a substitute for the lack of any +1 TV service offered by the BBC.